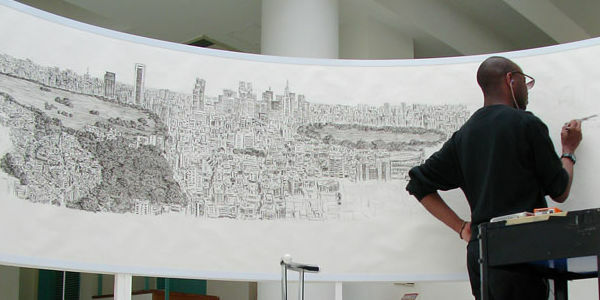 Stephen Wiltshire was born in London and experienced delays in his development as a child. At the age of three he was diagnosed as autistic. At the age of five a staff member at Queensmill School in London noticed that the only activity Stephen really enjoyed was drawing and that it was his way of communicating with the world. Besides his fascination with drawing American cars, Stephen began to sketch landmark buildings at age seven. He finally learned to speak fully at age nine and started his career as an artist shortly thereafter. In 1987 Stephen came into contact with literary agent Margaret Hewson, who lateron arranged that Stephen could enroll at the prestigious City and Guilds of London Art School where he studied drawing and painting and graduated in 1998. What makes Stephen unique from any other artist is his photographic memory combined with his ability to put these memorized images onto a canvas lateron. 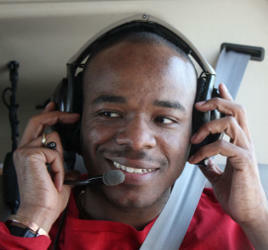 He took part in various TV programs which flew him in a Helicopter over various metropolises and had him draw what he saw lateron on a giant canvas. The amount of detail Stephen is able to reproduce from memory is absolutely amazing and earned him the nickname "The Living Camera".